The Apple Tree is a Broadway revival, back for the first time in 40 years, as a Roundabout Theatre Company production, at Studio 54. This revival also marks the return of the vivacious Broadway star Kristin Chenoweth to the stage on Broadway after 2 years, after her great performance in Wicked. In this Gary Griffin directed, and Andy Blankenbuehler choreographed musical from the book by Jerry Bock and Sheldon Harnick, Chenoweth has a trio of distinct one-act musicals. As Eve, in the musical act based on Mark Twain’s The Diary of Adam and Eve, as Princess Barbara in the musical act based on Frank R. Stockton’s The Lady or the Tiger?, and as Ella in the musical act based on Jules Feiffer’s Passionella, Kristin Chenoweth is irresistible. With the lovely music by Jerry Bock, and the lyrics by Sheldon Harnick, The show, itself, is irresistible and is a must-see musical for those who love theater and musicals. This musical gem celebrates the temptation of the forbidden fruit. The Apple Tree hilariously takes you back to the Garden of Eden; makes you discover the danger of a lover who is jealous; and makes you see what happens when dreams come true. Spend an evening watching this lovely musical – actually three one-act musicals – about men, women and the love between them. 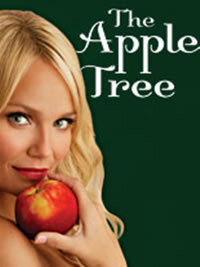 The Apple Tree previewed on November 28, 2006, and opened on December 14, 2006 at Studio 54, long after first performing all those 40 years ago. The revival is back for a very short run, up to March 11, 2007. Studio 54 is the theater where The Apple Tree is performing on Broadway. Studio 54 was built in 1927, and was then known as Gallo Opera House. The Opera House was foreclosed and sold soon after the crash of 1929, and re-opened in 1930 as the New York Theater. The theater, too, saw no success and changed hands and names many times, from Casino de Paris, to the Palladium, and then to Federal Music Theatre. CBS purchased it in 1942, and first re-named it the CBS Radio Playhouse Number 4, and later Studio 52. The theater was sold off again in the 1970s, was renamed Studio 54, and was converted into a nightclub. First leased by the Roundabout Theater Company in 1998, Studio 54 was purchased by them in July 2003. We, at Reedstickets.com, can help you purchase The Apple Tree tickets for the show of your choice, if you are unable to procure them from the box office. The tickets at the upgraded 1,015-seat capacity Studio 54 are difficult to come by. Our competent staff can arrange to procure The Apple Tree tickets for the show of your convenience, and the premium seats of your choice. All you need to do is to get in touch with our professional staff and let them know of your requirements, and leave the rest to us. The Apple Tree tickets you require will be delivered to your door, well in advance of the day of the show.